I have for a very long time been fascinated with space and the amazing objects out there. The Hubble Space Telescope has "caught" the Boomerang Nebula in these new images taken with the Advanced Camera for Surveys. This reflecting cloud of dust and gas has two nearly symmetric lobes (or cones) of matter that are being ejected from a central star. Over the last 1,500 years, nearly one and a half times the mass of our Sun has been lost by the central star of the Boomerang Nebula in an ejection process known as a bipolar outflow. The nebula's name is derived from its symmetric structure as seen from ground-based telescopes. Hubble's sharp view is able to resolve patterns and ripples in the nebula very close to the central star that are not visible from the ground. 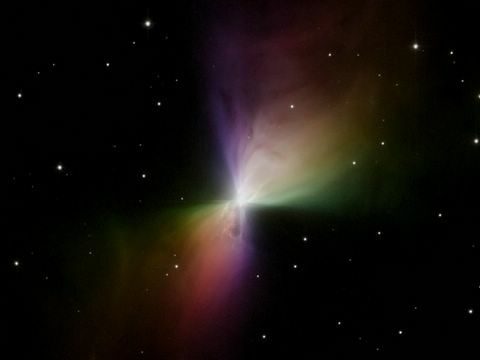 The Boomerang Nebula is about 5,000 light-years from Earth in the direction of the Southern constellation Centaurus. Measurements show the nebula has a temperature of only one degree Kelvin above absolute zero (nearly -460 degrees Fahrenheit). that's a really nice nebula. did you do that? If so, good work. No, unfortunately I don't have the equipment to take those kinds of photographs. The Hubble Space Telescope took them. My nebula is much bigger than that. Shott, if you don't know it already, you'll like this site. I copy pics from the archive to use as my background and screen saver (it cycles through pics from My Pictures folder). I've got some bigger ones, too, pup.